Here is a technique for searching particular primal forms. I contemplate mechanics of outlines and patterns freed from volume and surface area. I contemplate orbital and axial implications. One favorite tool which automatically does arduous calculations for this is the helix tool. However formulating the sequences and combinations of controls is the job of the artist. I wanted to contemplate helical patterns for the astronomical image called The Cat's Eye Nebula. I have underlaid part of the famous Hubble photo from the web within my modeling project. (3d Modeling was done in formZ version 8.2). The photo imagery presents a model for me to trace out potential mechanics. The superimposed, blue and purple spherical outlines, in the model above, are spherical helices. (This ball helix is defined in the tool options shown, except that the "wire path" is too small to readily notice.) These blue and purple spherical vortices, in this example, happen to simulate single axis spheres, but of a unique type. The "tail like" portions are suggested extensions. My conceptual exploration searched other variations, (presented further below). I have always been fascinated by this kind of geometric exploration. I decided to term this helical process "scalar orbiting". I'm proposing the term scalar, to suggest transitioning an orbital axis in size and direction simultaneously. This apparently can be generated geometrically, in two manners, as follows. 1] By orbiting a larger orbit around a smaller orbit. (Spherical Helix). Which is also equivalent to: 2] Vastly scaling individual orbit segments, while not scaling the group-orbit center. (Torus-Sphere). My next illustration substitutes helices with plain wire circles, which arrange more easily. (Popular geometry tools do not include these geometric functions, or not to my knowledge. Popular tools are geared for more market oriented design purposes instead.) Next image: The circles clarify compelling orbital group relationships between spheres, tori, and shifting polarities. Circular-axis placements are fitted to a torus outline. Vastly scaling up these circle diameters, based on their own original centers, ultimately forms a spherical outline. This might be an overlooked and under rated art (or design principle), in my opinion. The original, 2012, gif animated version of this concept is located at this link. Multi-axis spheres offer practical characteristics. I'm not aware of math tools which generate these sorts of functions. (Forgive me if i reinvent another wheel. Please indicate relevant math with an email, so that i may politely improve my statements and link it here.) Generalized geometry defines a torus as a tidy surface with area and volume, while also banning self intersecting surfaces, (or intersecting volumes). However orbits are conceivable without volume or surface area. A useful application for the scalar-orbits is the generation of multiple axes, in one spherical wire form (or one path). The traditional geometric sphere has just one axis, defined by longitude and latitude. A scalar orbit can simulate spheres with controlled patterns with multiple axes. The scalar-orbit is controlled by primitive orbital segments. Multi axial spheres fascinate me in a variety of ways. A spherical coil can be varied for unique electronic properties. Another possibility might suit particular visualizations, such as multi axis vortices for atomic structure modeling. This also might suit rationales of purely energetic-structure in contrast to old fashioned solid-matter rationales. The blue lines, in image above, weave many nodes or potential axial poles. The symmetry and better distribution of these poles can be refined by editing the primitive, or by evolving more effective primitives. Resolution adjustments and controlled rounding can produce smoother results. Despite pondering these ideas over the decades, i feel there is so much more to learn. As multi axial coils, these would be nearly impossible to hand wind, but the evolution of 3d printing may one day automate production of these as electrically conductive coils, to explore for specific effects. In this case the clearances of the conductive paths will demand greater care, than my preliminary modeling shown above. It is not worth the more laborious, "solid modeling" time, of these patterns, until an affordable, electrically conductive circuit printer is available for use. (Lower cost 3d printers have yet to print conductive circuits economically.) Endowed lab owners might not appreciate the potentials described here. Finite element analysis (FEA) software might otherwise test good 3d model files, for electrical characteristics. However, there might as yet be new characteristics to discover, which are unknown to FEA or to certain brands of FEA. One problem is that advanced arts and advanced technology are greedily coveted (and free development is suppressed). The red rings (above) are face centered upon geodesic sphere bases. These models are relatively easily generated, using geodesic tools. However, getting all these rings energized in series or parallel, either test will require artful interpretations. This can imply generating flat, lapping coils. An automatic, flat, lapping helix tool does not exist to my knowledge. I can offer winding art but not mathematical formulae. This would mean tracing a continuous curve on the symmetrical parts of a polyhedron. This can form a closed circuit curve based on the polyhedra. Here we might formulate face centered, multi axial windings. However these axes are off centered from one another, (defined by angles about a common center). The range of multi axial outcomes is very wide and time consuming to explore. Furthermore, comparative study of parallel versus serial energizing of multiple sphere arrangements is also deserved. Pulse energizing is another aspect to explore. I am not aware of other multi axial research covering these topics. The turquoise colored ringed sets show that geodesic faces can be scalar-ized as 'primitives' to reset orbits spherically. The left model shows many plain wire rings while the center and right hand models show banded rings, (to adjust conductor compactness). I can imagine this as molecular-mimicry, and perhaps as bonding mechanisms. I can see these as force field alignments, which constitute atomic particles or even as atomic structures, formed exclusively with energy . I can only claim very crude experimental results like this oscilloscope display (above photo), of crude multi axial coil effects. 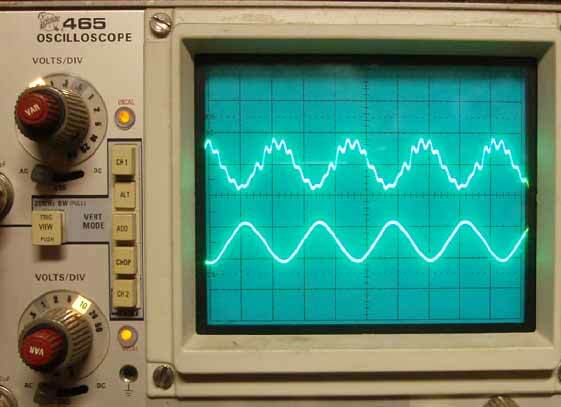 The dual trace oscilloscope simply compares a frequency multiplication effect generated by multi axial coil alignments. Very preliminary, multi axial coil arrangements were tried. The scalar orbit principle interposes the axial centers for greater power density- According to specific angular relationships, as yet to be mapped out for critical parameters. I have explored some parallel lapping coils here. Parallel lapped coils and spherical coils suggest uniquely interesting applications for timed pulse energizing compared with shaped waves as well. Pulse lengths equal to single-full turns, also compared with just the rise time of the wave would provide more tests for critical effects. I detailed some additional thoughts on pulsing parallel lapped coils here. Further testing is deserved to adjust pulse lengths and rise times, across one or multiple turn lengths, to further sculpt the resulting fields. I never earned enough money to buy needed equipment nor could i promote this research. The scope above was many decades old, (from surplus). I have been otherwise content to focus on geometry tools instead and web publish my concepts, open source fashion have used rings to tessellate structure and even to reinforce real-life, composite solids. This reinforcement application has earned me a pittance on one hand and great satisfaction of principles on the other hand. December 2016 ~~~ My Latest Electromagnetic Research On A Radical Radial Pole Coil ... Much better frequency harmonics, even with a broken generator. This tetrahedron is actually a spiral, (see this link). This tetrahedral generation can be a genuine facetted helix, within a given physical, engineering resolution. The link demonstrates that it is actually a "scalar orbital" in facetted mode. The facetted version means it is drawn with a specified number of straight segments, (instead of a continuously spiraling curve). With continuous, spiraling, smooth curvature, in the helix tool settings, the same helix, takes the shape similar to a wire outline of a propeller. (See greenish object below). The propeller outline is then used as the primitive of the scalar orbit coil. The propeller shape is magnified on the left, but it is too small to see inside the "scalar orbit" to the right. (See above link for more detail on how a plain triangle is used to generate the propeller or the tetrahedron, depending on the tool settings.) Scalar orbiting reveals useful geometry, whether we scale the product diameter up or scale it down. It is all so interesting. I choose the word scalar to emphasize the critical scaling or size-conditioning based upon two or more, interdependent radii. I expand the meaning of scalar orbiting as a much-larger-radius-helical winding about a much-smaller-radius-primitive path, (or multiple arrangements of these). The larger the ratio of these 2 radii, the truer does the sphere or spherical helix form. Truer in the sense that all segments of the resulting, "larger sphere" will have nearly equal radii. There is always a small variation of radii, governed by the comparative ratio of the primitive source shape radii, to the product radii. Incidently, real world, or solid 3d world clearance paths might be adequately controlled by setting the primitive radii, equal to conductor plus insulator diameters. Further efforts to assure all segments bear sufficient clearances, might deserve better tools. This is due to physical constraints: If a filament or wire were forming the ultimate spherical coil, then in that case, the radii must weave and therefore vary in size. My current objective was not especially concerned with self-interferences of spherical paths. The models presented here are intended only to simplify presentation of principles involved. As the author lives on almost no income, this blog is only meant to inspire better arrayed workers in the art, to go further and do better. I explored my first computerized spiraling models in1995,(like above example). I have been contemplating the photographic evidence of baffling, astronomical displays, which are kindly provided by astronomical observatories. My favorite photo image is titled the "Cat's Eye Nebula". 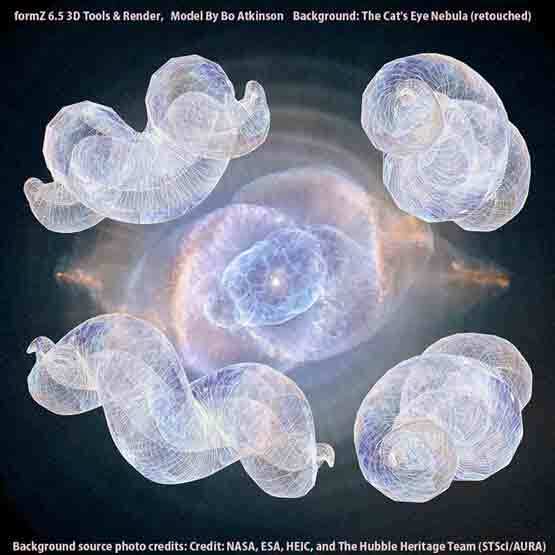 Here is my 2007 effort at modeling the nebula spirals. Apparently i timed out and had to ignore the spherical aspects now included at the top of this page. "Smooth objects" have been improving for solid geometry but still instantly add unwanted artifacts not relevant for my limited presentation efforts. The image below features older "facetted objects". Over the years i considered that two spherical vortices are evident in the photo. The interpenetrating intersection suggested possible multi axial, vortical interactions, of some kind. This stimulated my efforts to publish more thoughts on spherical vortices . 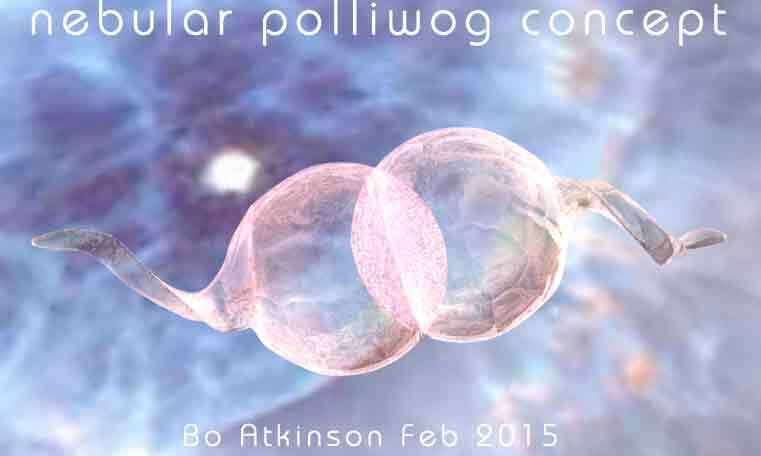 Below, a primal vortex is visualized, (by use of solid geometry), as a polliwog, overall. Two acting together bear a third inner and more linear spiraling helix. I spent some months trying out differing modeling approaches for the components. I have not yet come up with a satisfactory interpretation of the inner helix. I've not really worked on "rendering materials" to surface my models. Instead, reflections of the Hubble photo provide a quick surfacing, made transparent to consider geometric aspects. I have always needed to focus on making a living with my rural trades. So i spend most of my time trying to develop and market income producing work. But the builder who avoids traditional designs rarely makes much income. Therefore unpopularity allows the inventive spirit to enjoy pure modeling, while the challenges of hard living spark the inner imagination to jump start innovations. My earliest work with 3d concentric coils. My 1980 experiments with feeble currents and crude coil winding. Sunspot Coil Model ~ Yet another unique exploration of multi axial fields on a sphere.